Watching a snarling Ricky Ponting storm off at Trent Bridge after being run out in the 2005 Ashes Test is one of the defining moments of that epic series. Gary Pratt, the man responsible for Ponting's demise, became an instant England hero. Many greats of the game have strived for an entire career to earn their spot in Ashes history. Substitute fielder Pratt's fame was achieved in a split second. "It was just a case of see the ball, pick it up and throw it," the 31-year-old told BBC Sport. "You don't really think about it, you just get on with it. "As a batsman you know your fielders and their strengths, but as a fielder it's a bit different. You just hope to tempt them into a run. "The thing that people tend to forget is that it was a diabolical run by Damien Martyn - there was never a run there." England fans have not forgotten the significance of Pratt's brilliant pick-up and direct hit from his position at cover. At the time, Ponting was well set on 48 and the Australians looked in a decent position to build a healthy lead, despite having been made to follow-on. But Pratt's intervention, and Martyn's departure soon after, returned the initiative to England and they went on to edge to a three-wicket victory on a nervy fourth day. Now captain of Minor Counties side Cumberland, Pratt knows he will always be remembered as the guy that riled the Aussie skipper and the world's best batsman. And although he now says he is happy to embrace his association with that moment, he has previously acknowledged that his brush with international fame "probably hampered his career". A left-handed bat, Pratt failed to progress despite a promising start to county cricket at Durham. Released in August 2006, he has been with Cumberland since the following year and has skippered the side for the past three seasons. Pratt was born in Bishop Auckland on 22 December 1981. He played cricket for England Under-19s and won an award for being Durham's most promising young player in 1999. Pratt made his first-class debut against Lancashire in July 2000. He scored more than 1,000 runs in the 2003 season. Released by Durham in August 2006. Joined Cumberland in 2007 and named captain in 2010. And he says he is happy with his life outside the first-class game. "It's going well," he said. "I enjoy being captain; you are always involved. We are doing OK and I have scored a few runs this season." His last outing saw him score a fine 104 to help Cumberland earn a draw against Lincolnshire and he also skippers his club side Richmondshire. Pratt now combines his playing duties with his day-time job selling cricket equipment, but he was back at Trent Bridge on Thursday for the opening Test of this summer's Ashes - but purely in a spectating role. "I still have great memories about that series and that day. I was involved in four of the five Test matches (he was not present for the first Test at Lord's - the only one England lost) and it was a massive moment," he said. 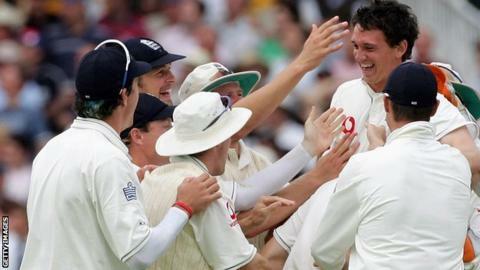 In 2005, his appearance caused a huge stir - although Pratt recalls it was not regarded as a big deal in the England camp. "There wasn't much chat in the dressing room afterwards, but Ricky did flip out a bit and the press talk was all about how Australia were rattled. So much of it was made in the media," he said. Certainly, plenty was made of it in the Aussie dressing room. The tourists were upset about England's use of substitute fielders throughout that series. Ponting's reaction to his dismissal was amazing. Clearly furious at gifting his wicket away with a run out, he vented his anger at England's entirely legitimate use of a substitute for Simon Jones, who was in hospital at the time for tests on his ankle. He shouted obscenities at the England balcony as he stomped into the pavilion - a sure sign the Aussies are now rattled. And when Ponting was dismissed by a specialist fielder they believed had been brought on to help rest weary bowlers, their anger exploded. Many saw that as the crucial moment in the series. England went on to win at Trent Bridge and then drew the final Test at The Oval to win back the Ashes. In fact, on that occasion at least, Pratt was a replacement for Simon Jones, whose ankle injury was a serious one. Nevertheless, he concedes the Australians did "have a point" about England's use of sub fielders. "They could have done it too, although I suppose it's more tricky when you are on tour," he said. After the series, Pratt, who is still good friends with Durham and England bowler Graham Onions, was part of the "amazing" open-top bus ride through London, organised to celebrate England's first Ashes win in 18 years. And such was his contribution that there was an attempt to get him to travel with the squad as a good luck charm for the ultimately disastrous 2006/07 series in Australia. How England could have done with a moment of fielding brilliance to end Ashton Agar's remarkable innings on Thursday. And on the same day the 19-year-old was clubbing England's weary bowlers to all parts, a certain former Aussie captain called time on his first-class career in typically majestic fashion. Ricky Ponting...now whatever happened to him?